Fabulous Bingo has got some fabulous offers, and all you have to do is play with them this spring to mag such great deals. Fabulous Bingo is currently offering an exciting and enticing welcome bonus which is worth a 200% match. Let’s find out more about this bountiful bingo bonus. When you make your maiden deposit as a new player at Fabulous Bingo, you can claim a hot 200% match deposit bonus on the very first deposit you make. For instance, a measly £10 deposit is enough to see you able to pocket a £20 bonus, which will see you start playing with £30 in your account. That’s not a bad way to kick things off right? 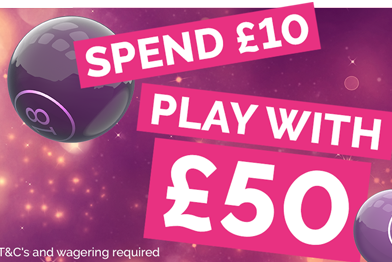 As well as the main welcome bonus, there are also other offers and deals for you to snap up when playing at Fabulous Bingo. Players can claim a Golden Quest 20% cashback bonus this week, on all losses on the Pyramid: Quest for Immortality slot. They could also pocket 20% cashback on their losses (up to £20) by playing some of the other favourite games housed at Fabulous Bingo, especially those devised by Barcrest. Fab Points, super link bingo games, and two for the price of one deals on bingo cards are other, additional offers you can snap up at Fabulous Bingo. To ensure that you get the very best deals you can do from the online bingo world, make sure you that you choose to make them your new home for online bingo gaming. Only after registering can you enjoy one of the UK’s freshest, hottest, and most promising bingo domains. You know what you have to do, and you know what you want to do: join Fabulous Bingo this spring.